Meet Julie Chen. 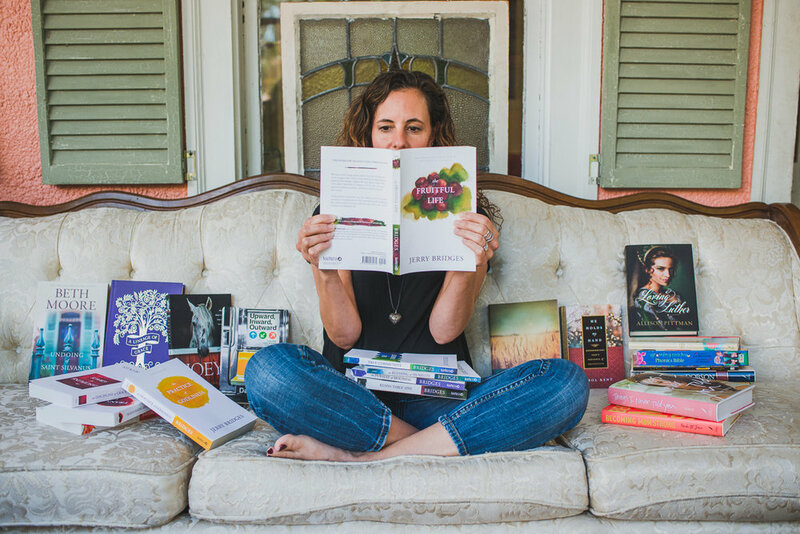 Julie is a book designer at Tyndale House Publishers in Wheaton, IL. In addition to her work there, Julie is an accomplished photographer and artist, and the creator of Life Verse Design. A true artist, Julie is an inspiration in creative expression. G: I want to hear all about your job. What do you do, and how do you do it? J: I am a Senior Designer at Tyndale House Publishers. I have been there on and off for 21 years. I design books, and I love it! People don’t always understand what a book designer does, because they often think I am the author, the photographer, or the illustrator. To which I tell them “no, no and no”. I then explain that I put the face on the book. The covers always come to me only with the title, the byline, and then the manuscript. I work with a team, and we begin the process, usually before the book is even fully written. The work that we do is a key part of marketing the book before it is released. G: What is the whole process like from start to finish? J: The Acquisitions Editor will give me a synopsis of the book. Sometimes I get a manuscript, or a table of contents. We go through key words of what the audience should think or feel when they view the cover. Do we want them to feel calm and hopeful? Do we want them to feel intrigued? Do we want the author to appear trustworthy? We talk about the audience. No two projects are the same, which is one of the things I like about my job. I am always getting to do something new and fresh and different. It’s a lot of problem-solving and creativity. Everything on the cover has some meaning. I am always thinking about colors, typography, and images to create the art for the cover. It’s more than just creating a pretty face. As the designer, I create anywhere from 5-7 covers for each book to present to my design team, which we then present to the marketing and acquisitions teams. G: There is so much that goes into the designing of a book cover. Oftentimes, it’s the thing that we gravitate towards the most when we are picking up a book. And yet, most of us don’t realize the depth and thought that goes into creating that cover. J: People always say, “Never judge a book by it’s cover”. But I always say, “You should choose a book by it’s cover!”. It’s the first thing someone sees. We have five seconds to grab someone’s attention, especially in today’s age of shopping on Amazon. We are all overloaded with visuals all the time. G: Right? We are all scrolling through and so bombarded, more so than ever, with what we see visually. And you are having to compete with all of that. J: Yes, that’s true. Another thing I think is interesting about book design is that people go to the library or the book store, and they never think about the five to twenty covers that were rejected before the book got to that point. Any book you see out in the world has a cover that was not the first one that was created. G: Tell me about that. In the creative process, sometimes we can get invested in something that we make. But in this sense, the author might reject what you have created. Your team might reject it. How do you handle that rejection? J: It’s come with 21 years of experience. I am very passionate about my work. I am not going to go half-way. I am all-in or nothing. So, I will give it my heart and soul until the end. Dealing with the rejection comes with time and learning to trust the team. I think one thing that helps that process is looking back at past books I have done. The covers might not have been my favorite at the time, but now that the book is out into the world and I see the whole scope of the project and who is gravitating towards that book, I can look at it and feel confident knowing it was the right cover for what it had to be, even though it might not artistically be the most creative or my favorite. G: You get to see these books go out into the world and end up on people’s bookshelves, at the library, at the beach or the pool. What is it like for you to take a seed of a creative idea and see it published and given expression? J: It is very humbling. It’s joyful. Every day when I go to work and even think about my work, it is such an honor to do what I do, because I know that every book cover that I create, and every Bible that I help create, is going to touch and literally change lives. I’ll never forget the first time I saw a book that I worked on in an actual bookstore. I was with my husband and I just felt giddy, like a kid in a candy store. I felt like, “I did that!”. It’s an awesome thing to be a part of. G: You obviously love what you do. You are such a creative person, and when it’s your job, can it sometimes be hard to find that inspiration? How do you deal with the ebb and flow of creativity and the muse? How do you push through the creative ruts? J: Pinterest is a great resource, and I am always pinning books. The big thing for me is my co-workers though. At Tyndale we work as a team, so that helps. We bounce things off of each other and they can bring their strengths to my weaknesses. My strength is always the image, finding photography, and art directing the illustrators. My covers are always image-driven. But I will also just go to Anderson’s or another bookstore and just get lost. I also use word lists when I get stuck and they spin off ideas and colors. G: You are also a photographer and are such an artist all around. What are the things that fill your creative well? J: My first thought is nature, for sure. I definitely come to life in nature. It’s everything. The lines, the branches, the textures, the colors changing. Just the little small details of flowers, the grandeur of the mountains. All of that. I just really live life to the fullest when I am out in nature. I also collect children’s books. I just love picture books. They inspire me so much. I don’t know how that translates to my job, but I am sure it does in some way. But I have a deep appreciation for illustration. G: Are you an avid reader? What is it you feel about reading is important? Why are books important? J: My kids are big readers, probably because I read so many children’s books to them. If I do get time to pick up a book, it will likely be non-fiction. I want to learn and be changed by it. I think books are great tools to inspire us, to change us, to give us knowledge. And then on the other side, I think of my 13 year-old, who escapes through books. It’s really cool how a book can put you in this whole different world. In a movie, someone has already visualized it all for you. But when you read a book, you get to do all of that imagination in your head. I just think it is so important to fill your shelves with books. G: I agree. I think there is something magical about what we get out of books and carry into our lives. There are so many ways we are affected by what we see or read. You are a busy, working Mom of three. How do you juggle it all? J: Definitely my spiritual life. Reading my bible, and prayer. Talking walks with the dog. Being out in nature in the fresh air. Even if it is freezing cold out. I love photography, and that is a personal creative outlet for me. In the last two years I have started exercising more. I am not always a good self-care person. I can tend to pour myself out too much. But I try to exercise three or four days a week and make that a priority even when I don’t feel like it. I never regret going, and I feel like it makes a difference. Spending time with friends is always big for me. The laundry will always be there, but if a friend needs to go for a walk and talk, I’ll do that. Relationships are very important to me. G: Is there anything else you want to share? J: Looking back on my life, I was very influenced by my high school art teacher. I often think about how important it is for us to encourage our kids in their giftedness. I had parents who were so supportive. Going into the arts is a risk. Not many people make it. Not many are able to use their passion as their job, so I always think about how fortunate I have been to be really encouraged by that teacher and my parents. To then give my dreams over to God and see Him make them come true has been amazing. I will joke with my husband, “I got paid to paint today!”. It’s just the best. So, I would just say to encourage your kids in their passions and what they love. You never know what they will make of it.